There are no two ways of looking at it. I had my big opportunity last week and I blew it. After my recent disparaging comments about garage sales, my sister happened to ask me to take her to a huge second hand book sale last Friday. I felt like showing her my blog post but given she is visiting from another State, I couldn't really refuse. She loves reading, was more than likely born with War & Peace in her hands and calculates that she has read at least 2,000 books. Personally, I wanted to tell her that I think anything in excess, no matter if it broadens the mind or the behind, is a bad thing. I like books, don't get me wrong, but I'm a strictly no more than one in each hand at any one time kind of girl. Besides, as I told you in another post, my parents sent me to speed readings classes at 11 (who knows why?) and ever since then I have been a little chaotic in my reading style - I read the ending first. Yes, yes, shake your head because it is indeed a cringe worthy thing. Anyway, given she is an extremely lovely sister (one of three) who I share lots of deep and meaningful conversations with, I gladly went with her to the book sale(and it had nothing whatsoever to do with the fact that she promised to make me her ‘out of this world’ champagne and fruit cocktails). Except, this was not just a book sale. Or even a huge book sale. This was a MEGA book sale. When we walked through the doors I could tell by the look on her face that she thought she had died and gone to book heaven. Out of the corner of my eye I saw this elderly man with a long grey pony tail, cap, a leather vest, colourful tie, bright bag over his shoulder and blue jeans. Mmmm, I thought, he looks familiar. I just could not work out where I had seen him before. So I watched him for a while. Then, I got up and followed him around (yes, I was technically stalking but don't think badly of me). I tried not to be too obvious about it and kept a respectful distance. Then it finally hit me. This man was just no random book lover. This was Richard Larter. My favourite Aussie artist of all time. How completely unexpected. Now I felt like I had died and gone to heaven. I may have done a little dance of joy. I have seen famous faces before but somehow this random sighting of my favourite artist at a second hand book sale was way more exciting. I had just recently seen his exhibition at the National Gallery and I had bought one of his art books (I cannot afford his paintings). And now here he was buying someone else’s book. Someone else’s second hand book. I ran to find my sister to tell her. She didn't have a clue who I was talking about. She just shrugged and kept browsing. I then knew I had to get a photo. For my blog if nothing else. I felt like a member of the paparazzi and wondered if I should approach him or call out to him in the same way they do to the stars, Hey Richard, what designer are you wearing? Richard, who is the woman with you? Richard, have you had plastic surgery? Richard, who does your ponytail? Oh no, I didn't have it in me to be that forward. I took the coward's way out. I just followed him, pointed the camera, clicked, then ran and hoped he wouldn't notice the flash going off. And what did I end up with? This priceless piece of artwork. A blur to end all blurs. Well this is art ok, and beauty is in the eye of the beholder. If you happen to be one of those people who cannot see the artist in this picture then you clearly need to have your eyes tested. I know who it is even if the rest of the world doesn't. The sad thing is the poor man had his hand up to his face as well. I later read on the Internet that he shuns any kind of media attention (and that includes no doubt some crazed woman stalking him with a camera at a second hand book sale). I mean he is 79 years old after all, has been painting all his life and he only became famous in the last 20 years. My career as a paparazzi started and ended that day. Well, for obvious reasons. But my love for his work burns bright. Next time Richard, next time! Oh and have I told you that I now love second hand sales of any kind and description? Simply because you just never know who you might get to stalk. What about you, have you ever seen anyone you idolised and how did you handle it? 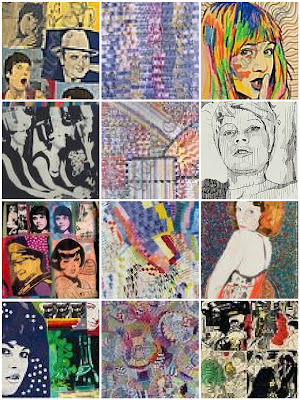 Top Image - varied artwork by Richard Larter. Great story, Ms. Lilly, told in your usual, entertaining style. Loved the whole image of you as a stalker with camera in hand. Loved that you posted the blur as evidence you "got him". Wish I could have been there...I am a used bookseller on Amazon part-time...ooh, what fun we would have had. Brilliant picture! Anyone can see who it is. Did you use a telephoto lens? What exposure? Etc.? Ok, ok! Sorry. Glad you enjoyed yourself anyway. LOL. That was too cute. I loved that you shared the picture of him. Hey, I think he'd appreciate not having the details of him on the Internet, but rather, now he is a "work of art." Hehe. I've never been that big on big names, bright lights. To be honest, half the time I forget movie stars, singers, book writers, etc. Now.. the second hand book store ~ I'd be in heaven there too and spending my week's pay, no doubt. I love to read! Thanks for the smiles, picturing you there, sneaking up on the man and then a fast flash of the camera. Lol..
Oh how I would have loved to watch that stalk. You seeming nonchalant, browsing around the books yet keeping the un-mistaking eye on your prey. Then the sneak attack, quick as a lioness guarding her cubs, fearless as a, well I don't know what. Then the retreat, fast as gazelle on the run from a cheetah. Uh I do have one question though. What is wrong with "excuse me Mr. Larter, I am a big fan of your art, would you do me the courtesy of allow me a picture". I have never met someone whom I idolize. My father however did. He was a big fan of Clive Cussler novels. One day this older gentleman came into our service station in a very nice restored classic car. Dad waited on him, filling his fuel tank, washing the windshield, checking the air in the tires and the fluids in the engine. The gentleman presented dad with a credit card. In those days, we had to take the cards in and compare them with posters of stolen or abuse credit cards on the wall. Well as dad was comparing he realized the name on the card was Clive Cussler. Dad imprinted the card, and filled out the blanks. When he took out he "here you Mr. Cussler, and if I may say, please do not ever quit writing." Mr. Cussler signed the receipt and handed it back, telling dad he wouldn't and thank you. Dad took that receipt back in, framed it and put it on the wall, never even turning it in to the bank for compensation. @ Jlo - oh I didn't know you sold books too! This book sale happens once a year for a very good cause - a charity. But I have never been to it before. It was in a stadium - huge it was and you could have easily spent days there. They jsut kept replacing the books with more and more. It was held over four days. It was run by volunteers. I should volunteer next year I think. @ CJW666 - he he - wouldn't even know what any of those things are -I just point and click. However, I am waiting for Judi Moran (see first comment) to do her course in cameras and then I am hoping she will post some salient information on how I can improve my techniques! Thanks for dropping by - you of course would have loved this book sale I would have imagined. @ Aleta - yes it was just like that - how pathetic, I was as obvious as an elephant running through pansies or something. No, I am not too proud to show you my shocking photo - makes me laugh and realise it's what I deserved he he. I dont seem to get embarassed much anymore. Must be old age except I will never grow up I think. @ Eric - now you raised the point that my family did. My father went on and on about it. Would it not have been more sensible to just approach him and ask him for a photo. Oh no, I was too shy (I know it's hard to imagine) but I was literally star struck. I was just so shocked to see hime there of all places. His work is not everyone's 'cup of tea' as it were so others do not see why I would even bother. Oh that is a simply wonderful story about your father. HE would totally get what I am talking about. Such a sweet story (to think the writer got free gas too!!). In fact the rich and famous just get richer because of that very thing I bet. Thanks Eric for your comment - love that story about your Dad. Lovely memory. Lilly - what a fun time that must have been for you, and a pleasant surprise to boot! I think it is very apropos that your picture of the wonderful artist turned out to be a rather unique work of art in its own right. So many times when we really don't look forward to attending an event like that we end up really enjoying it for one reason or another. I have never ended up enjoying one for the same reason you enjoyed this one but I can certainly relate to not getting a picture of someone or something when I had the chance. Thank goodness for camera phones now, you can get a quick picture almost anytime you want, even if they aren't the best quality. I often whip out my cell phone when I see a nice sunrise or sunset, or even a strange cloud formation or a rainbow, just because I love to take those kinds of pictures, and if all I have is my cell phone camera it will just have to do. And, by the way, I absolutely love the picture of the Gum tree!! The shape of the tree, the lighting, the whole somber quality of it. It really just grabs you, doesn't it? I would frame it! Thanks Matt - I have never taken a picture using my phone - thats strange now come to think of it. Everyone else seems to. That would have been a better idea as well and less obvious. I just havent learnt how to transfer the pictures from the phone to the laptop (mmm, I have a long way to go re technology when I think about it). To take the tree picture I had to lay on the grass because the tree is just too tall. It does look kind of ominous though doesnt it - it was very cloudy that day too. I would love to get a small video camera though - that would be kind of good to put up videos. Maybe I will do that when I go to Thailand. Thanks for stopping by, always love your comments. Two years ago, I went to a reading and book signing by one of my favorite authors, Michael Chabon. I asked him a question, didn't give him a chance to answer, giggled like a schoolgirl, etc. In short, and to be precise, I made a huge fool of myself. Oh well, even if I see him at another book signing, he surely will not remember me. At least I hope and pray he doesn't remember me. Have you ever been to a writers festival Lilly? You'd go nuts. Authors are everywhere! See my post of July 29 2008 re Byron Bay Writers Festival (on www.70plusandstillkicking.blogspot.com). It's great fun and on every year during August. Of course, there are many other such festivals around but this one's mostly pretty special, and writers use it as a great excuse to get out of their city of origin. I absolutely love garage sales. Junk is an obsession! Looks like you've got you're own obsession now. I took speed reading, too! 5th grade and I could read like a demon :) I never read the ending first though. I savor my sins. ha ha! @ Gran - finally a girl after my own heart - totally embarassing herself. Love it! And no, these authors would be well used to tongue tied people I bet! @ June - Do you know that I had not been to Byron Bay for years and last year my daughter took me there on a bit of a girls road trip. We had the best fun - they were filming that TV series East of Eden was it or something similar with Zoe Carrides(ABC). And I have never been to a writer's festival (do they allow groupies in? or can you pretend?). That sounds like tremendous fun - I am going to look out for it next year - I will be moving to Brisbane early in the New Year so it wouldnt be that far away! I love your writing by the way - what an inspiration you are! @ Trouble x2 - Tia, I knew we had lots in common. I honestly think speed reading ruined the way I read or study did anyway. I can never start anything at the beginning (I think I even read recipes like that too which could explain a lot of things). Junk? You like junk? I can arrange to airlift some of mine to Texas, how about taking it off my hands? OK, I am thinking about the street dancing in Texas and I have to say what immediately came to mind was 'line dancing' (I was born in the country and western music capital of Australia you have to understand) so what kind of dancing was it? I love people watching - nothing better - give me people any day rather than castles and buildings to look at. Thanks for you story about the Texan wildlife - must see post everyone - go to Open Door blog for an education! Yes, they let anybody in who has the required cash - even you! Look at the site of the Northern Rivers Writers Centre for details as the time approaches. And thanks for the praise - I'll need a size bigger beach hat! This is really one cool picture. Thanks for stopping by my blog -- come back for more! I enjoyed reading your story with camera in hand. I have just completed one year of a picture a day, and what a great journey it has been. My camera is always in hand. Thanks also on the compliment of the look of my blog. In the upper left hand corner of my blog is a link to backgrounds. Your career as paparazzi ended, but please promise you'll pursue that of witty-funny writer :). I think you handled it with finesse, not like me, who saw Kiefer Sutherland in Romania on some narrow street and shouted like some big demented freak: "OMG! What are you doing here?" as if we had been friends forever. He was kind enough to answer and I even got an autograph out of it. Moral of my story is that next time you meet some celebrity you admire, talk to them (not in my style obviously, you might risk chasing them away or even get beat up by bodyguards) because I have lerned that famous people are humble and love when a true admirer of their work presents his or her homage. @ June - ok, lets do coffee. Its' truly God's country there too. @ Meryl's Musings - I certainly will drop by again. Thanks for your comment. A picture a day - that is incredible! I will have to get some pointers from you. @ Rocksnowhite - oh how I have missed you! Lovely to see your comments - Keifer Sitherland? No wonder you screamed and you are right, I should have just done the mature thing and spoken to him. I am off to check out your writing now! 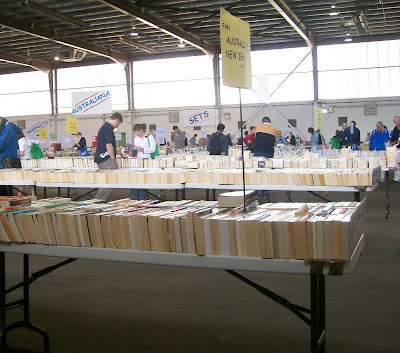 First of all - the pic of that book sale makes me foam at the mouth. I love, love, LOVE books. 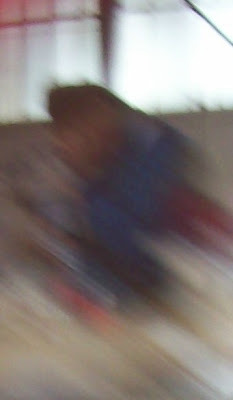 Secondly - the blurry picture made me laugh out loud because that is SO the type of picture I would take try to be sneaky. I love your blog. May I link to you? Thanks for stopping by -- today's picture will be at a high school hockey game because they are always memorable! Hahaha great story Lily. I saw Jean Claude Van Damme eating at the same restaurant we were, actually he was there first. He looked small in person though, I wasn't a fan so I didn't bother getting an autograph or anything. Also I saw Victoria Beckham and was a paparazzi for a day. Great picture by the way- very artistic;) LOL Are you gonna hang it on your wall? I met Deep Purple backstage when they toured the U.S. back in '84, I think it was. I also ran into Prince once at First Avenue. I have a friend who served Johnny Depp a "Root Beer Barrel", a kind of "shot". She said he was absolutely gorgeous, short, and rather shy. We see celebrities filming in Boston all of the time. There is an amazing aura about them. Something bigger than life itself. They just seem so be a little more "in color" than the rest of us. I tend to act all cool around them. Like "yeah, I know who you are, whatever!" But inside, I'm like..OMG! That's Ben freakin' Affleck!! I talked to Rachel Griffiths in line to see an art treasures exhibition years ago, at the National Libray. Look - kudos to you for making me type up what was just in my head for my gelato picture. Do you have a new ice cream maker? Ten years ago I put the old one that used ice cubes and salt into our last ever garage sale. I got the one litre Krups from Good Guys for $70. Now I can have all the fancy ice creams I want, a day after I think them up. And I'm using canned or frozen fruit, until the summer fruit arrives in the shops. P.S. I was an ebay book seller for a few years and I no longer frequent the old book stores - they seem to be full of my discards. I just buy on line these days, from ebay and Amazon. learned that he is a vag painter. Thanks! I love to discover new artists. @ Tami - thanks for dropping by and commenting. I left you a comment on your last post. @ Meryl's musings - and the picture is a great one - I will have to keep on checking them out. @ Jade - oh, Jean Claude - I heard he was really small - nah he doesnt do it for me either lol! @ Leslie - oh I remember that Exhibition too - it was truly wonderful. I seem to remember Jane Ayers journals or something.Glad you posted the sorbet details too! @ Pearl - ok well you have done well then in the star spotting. As for Jonny Depp - yes he is gorgeous alright. It's a wonder she could get the beer in the glass - I would have been shaking. @ Nina - yes he is a vag painter but whoever wrote that wikipedia entry is a bit way off. His wife was his muse for most of her life before she retired in the 90s and has since past away. He has a new muse who took over after his wife retired. I just love his style but then I love yours also. @ not the Rockefellars - wow, I guess you would get used to them where you live - Ben Affleck - he's lovely I think. Funny how they are normal people in one respect but as you say are larger than life nonetheless. I love your expression about them being 'in a bit more color' than the rest of us. True there are people like that. I will have to remember those words. Thanks for dropping by. What a way to start the morning! You are a great story teller Lilly! I could just picture the whole scene unfolding! This sounds like something that would happen to me. Too afraid to approach, just shoot and run. lol! I'm not really very star struck by anyone, but living so close to Dallas there is a BBQ restaurant not far from our house owned by Randy White (former Dallas Cowboy). The hubby and I went and had lunch there one day. As we sat there and ate I could feel someone looking at me so I turned and there he was big as life, Randy White!!! Now when I say “big as life” I really mean it. I’ve never been that close to a pro football player in my life and he was a huge man. Not fat, just in shape, very tall and muscular. He came over to talk with us and all I kept thinking was how excited my Dad would have been and how I wish I could call him and tell him who we had met. Even more so I wish he could have been there. My Dad passed away two years ago, my star struckness was on his behalf. He would have been thrilled! Funny story! I just found your blog and have enjoyed reading through your past posts! @ Ac - I visit you everyday, will leave a comment later. @ Christi - wow that is a lovely story and I am sure your Dad was looking on too. Your football players are big guys arent they even without the padding? I bet they find it hard to stay fit after they retire from football. He sounds a nice guy to come and talk to you though and I am glad you got to do that on behalf of your Dad. I know what you mean - thanks for stopping by and hope you are doing really well. @ Tiffany - thanks for dropping by, much appreciated. Will go visit your blog too! That's hilarious, and heartbreaking all at once. The only time I've seen a "celebrity" since I've lived in MN (and not even one I idolized) I was too busy pretending I didn't see him or recognize him. It was Stedman Graham. So, yeah, not really a celebrity but I still didn't know if I should acknowledge him or leave him alone. Heather - is that Steadman as in Oprahs Steadman? He is a celebrity by default. Yes it was hilarious, after the event except I was very serious at the time. Oh dear I make a fool of myself, too often sometimes...Thank you so much for dropping by. @ ytsl - well you know something about photography which is why I go to your site. Brilliant photos from your Photo Hunt. I've had a few famous people encounters...but I generally try to pretend that I don't know them...and wonder if they'd be insulted (I wouldn't be insulted if they knew me, after all). This is, of course, in the rare case that I actually DO know them. I've had plenty of celebs cross my path that I had no idea about. My most recent encounter I found out who he was half-way through the flight we were on...but even then I didn't let on that I knew he was "Somebody". I've had a few famous author encounters...which have just taught me that they're people too...and often seem to have a protective shell to insulate them from the nonstop barrage of inquiry and conversation that comes at them everywhere they turn. I think that would be hard to deal with after a while. Thank my buttons I'm not famous. Though I've had a few close encounters. I'll have to write about them someday. Blue, oh that was a great post. You will so have to write those stories. I have had a few as well when I was much younger - in London and the States. Love your site by the way!